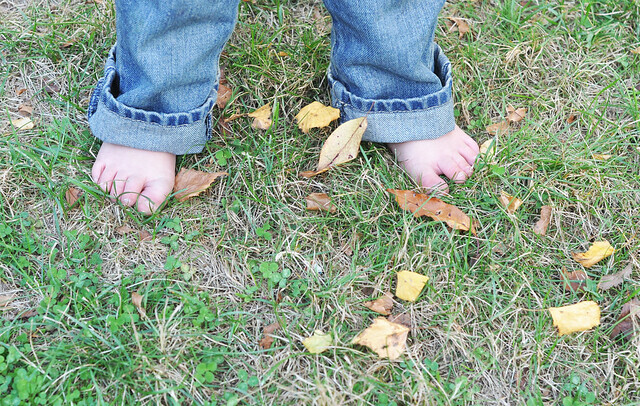 Although I'm a bit sad to see Summer come to an end, I do love Fall! 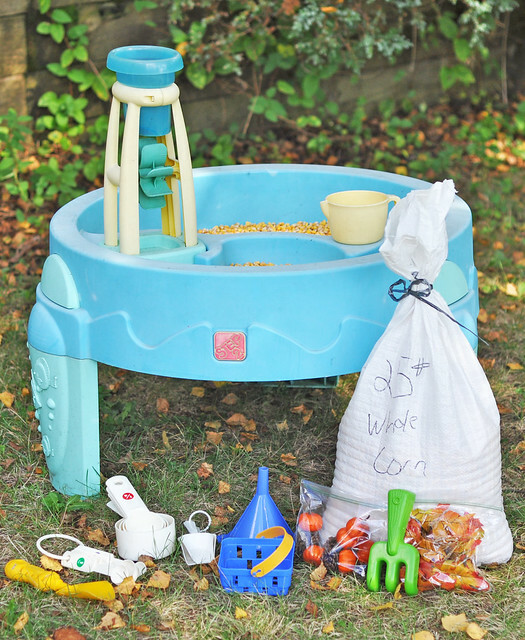 We packed away most of our outdoor summer toys already, but one item stays out year round: the water table! 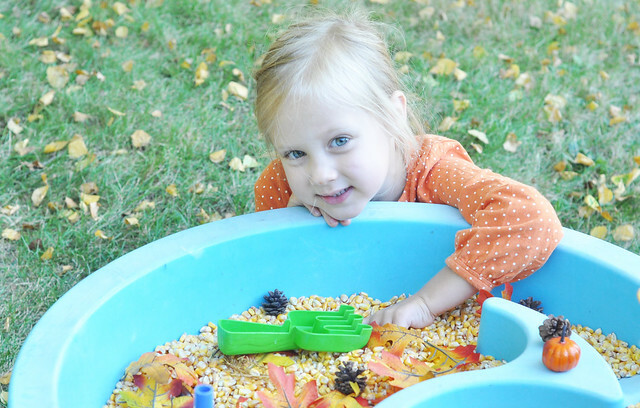 Yesterday, we dumped out the water, and readied it for Fall! 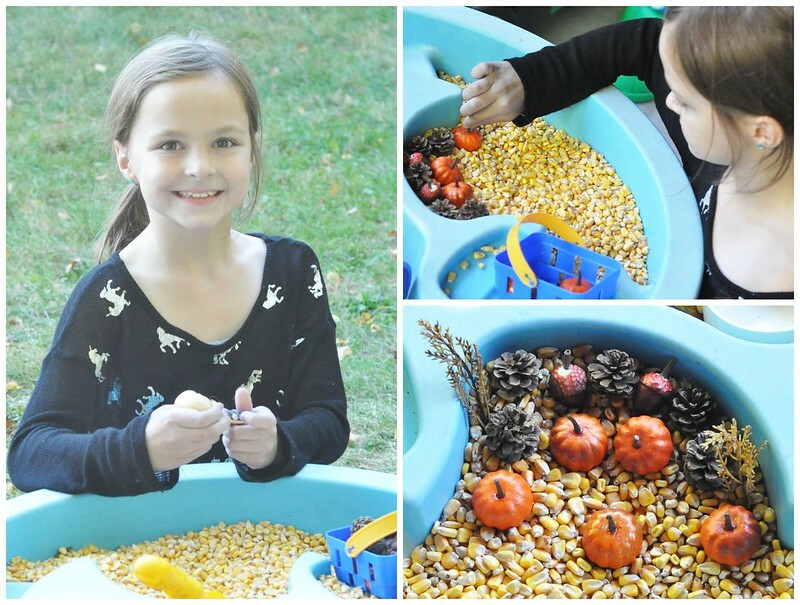 Dylan, Lexie, and Lily always loved it when I filled the water table with corn! For some reason, it makes it more exciting. I debated putting it off this year, due to Liam putting everything into his mouth, but I decided to give it a try. I'm so glad I did! 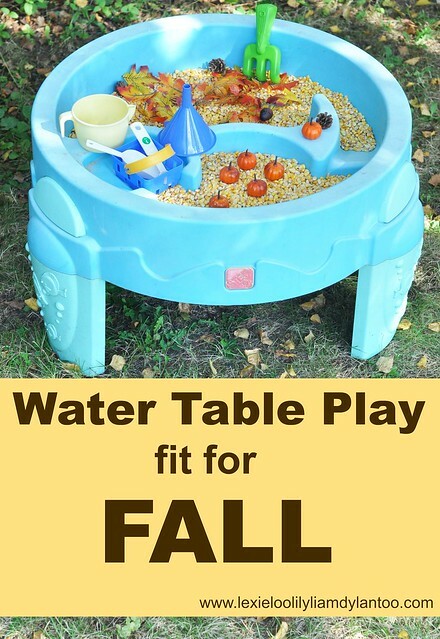 Our Fall-themed water table is quick to set up and all the items are inexpensive. Plus, if the corn ends up everywhere (and it will!) all those outdoor critters will eat it up! I removed a few items before letting Liam play, but he didn't seem to notice. He dug right in! Surprisingly, he only tried to eat the corn once, then realized it was gross! 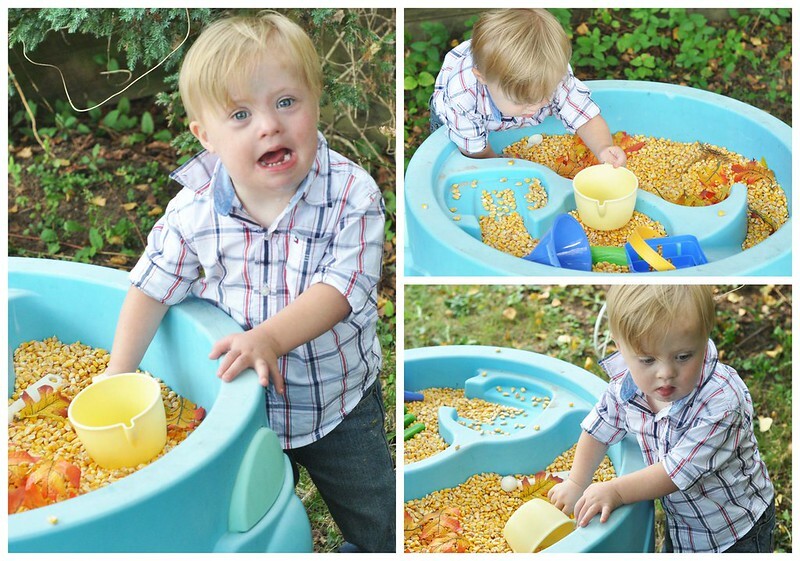 He decided scooping, dumping and throwing the corn was a better idea! 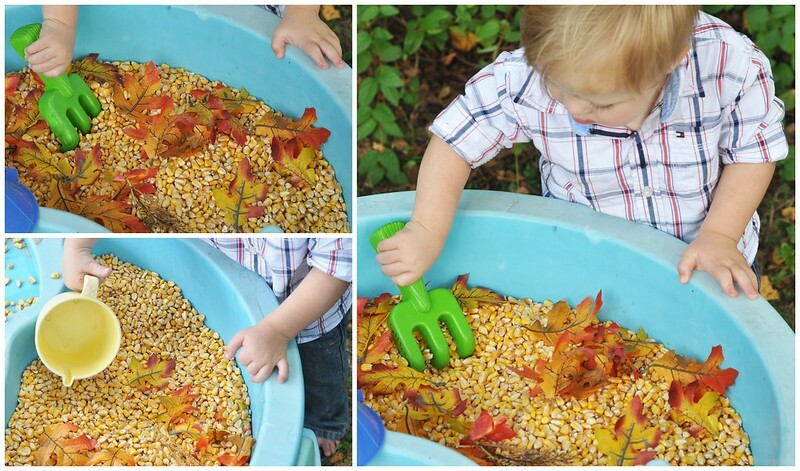 The water table filled with corn and leaves captured his attention and kept him focused. 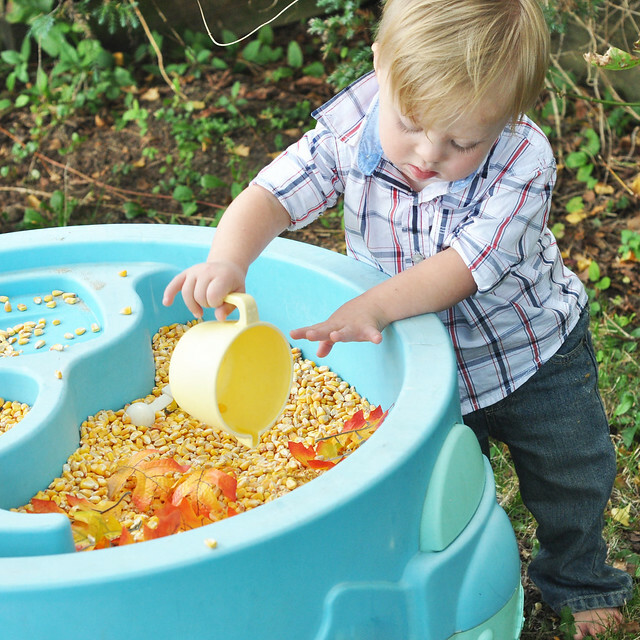 All that scooping, filling, and pouring was so much fun that he didn't even realize he was building those fine motor skills! He LOVED it! But it wasn't just Liam who loved it. Lexie spotted it as soon as she got off the bus, and ran straight to it. 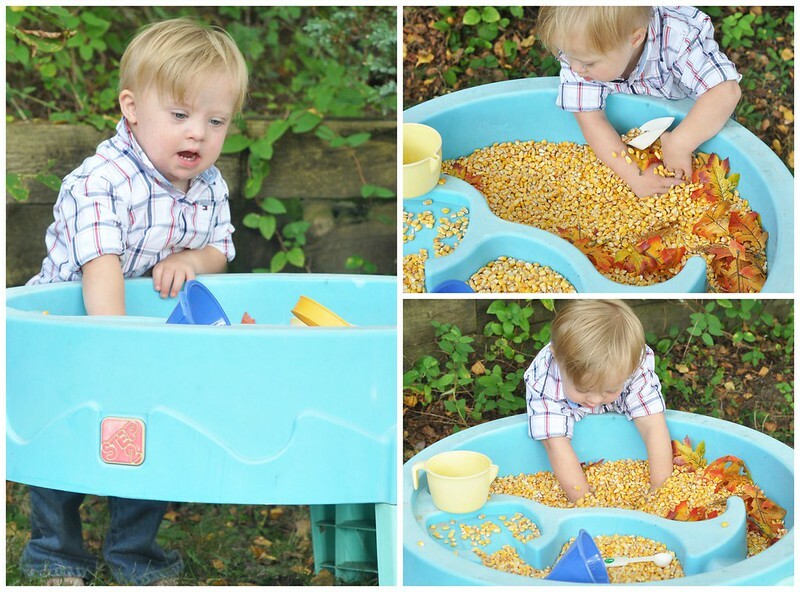 Even Dylan, who is too cool to play with baby toys, found himself sifting through the corn! After Liam was finished playing, he went inside for a snack. Lily woke up from her nap and I took her out to play. The moment she spotted the table, her eyes lit up! Lexie joined Lily and they ended up playing together for over an hour! 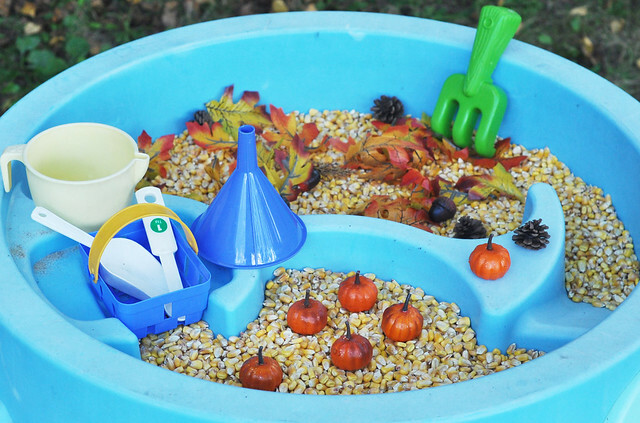 Our Fall-Themed Water Table was a HUGE hit! 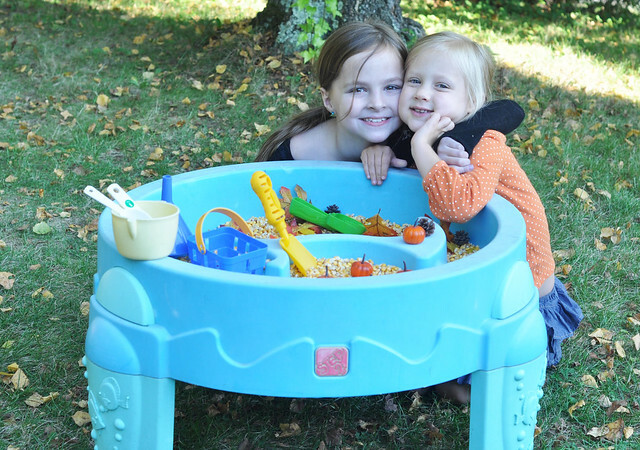 If you have kids, do you use your water table year round? 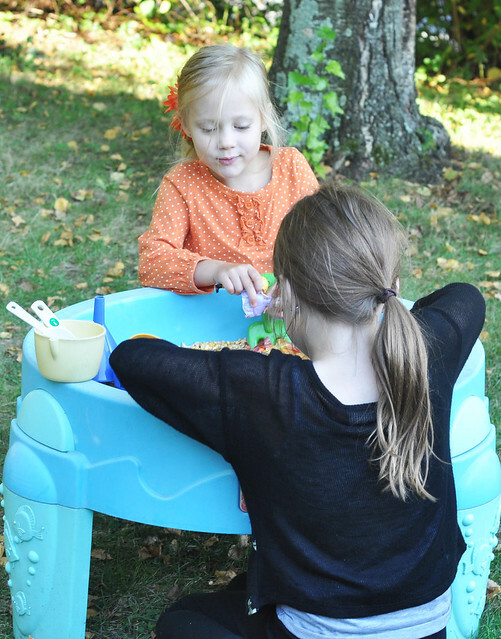 For another water table play idea, check out THIS POST. I'm definitely doing this! THanks! Liam LOVES it! I hope Alex does, too! This looks so fun. I wish I had thought of it when my kids were smaller. I bet they would still like it! I catch Dylan, who is 10, playing in the corn! Hehe Liam is too cute. 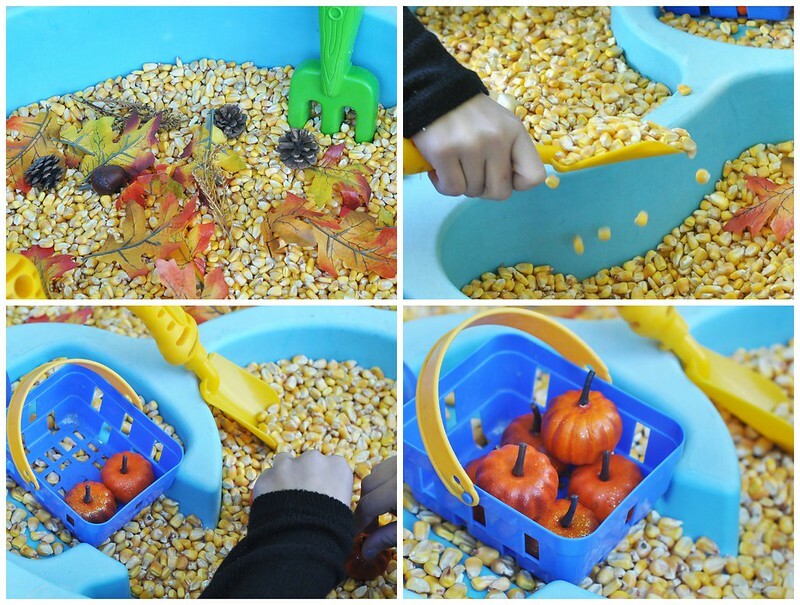 I think this is a amazing sensory activity, my girl would love it although I'd have to find something bigger then popcorn! She's in the eating stage. Thank you! I get it...I was so afraid he would eat it because he puts everything in his mouth still! Thankfully, he only tried once then realized it was disgusting! What a great idea!! This looks like so much fun! Great idea! 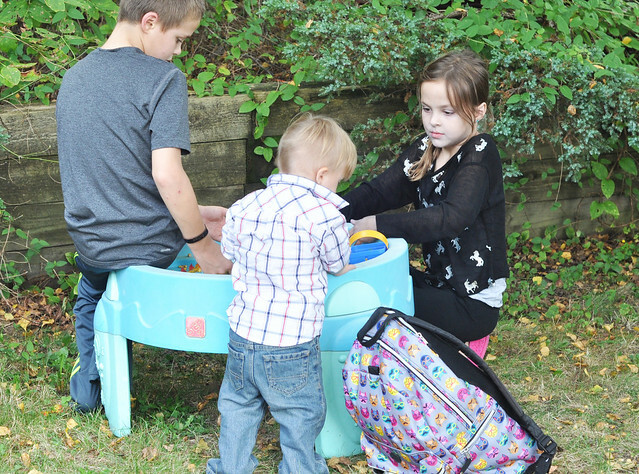 We have a water table, which here in NY can only be used a limited amount of time! What a fun alternative! Your kids def look like they are enjoying it! I hear you! It's good for water from about May until October in PA!